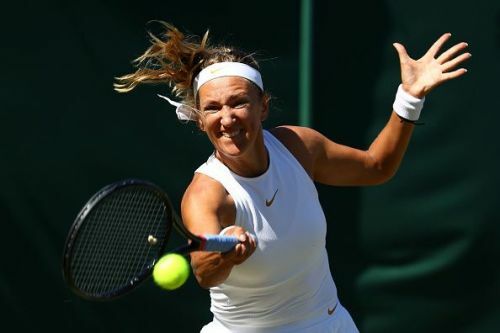 Victoria Azarenka had a couple scares on court but got the win she wanted at Wimbledon Monday afternoon. The former number one didn’t have a clean victory but showed her strengths while Ekaterina Alexandrova had moments of brilliance but eventually fell to the Belarussian 7-6(4), 6-3 on Court 18 at the All England Tennis Club. This was the first meeting between the two but not a first in the ladies draw for either one. The Russian was making her third straight appearance having gotten as far as the second round two years ago. Facing Azarenka wasn't going to make it any easier as the Belarussian was looking to get into her comfort zone in what was her 12th year at the AEC. The match began with Azarenka breaking the Russian in the opening game followed by her own serve being challenged as well. Alexandrova pushed the former number one again but managed to hold her chance for the AD in the second game. A scary moment occurred during the first point when Azarenka slipped and extended her legs to the point of causing pain. After a few minutes on the grass, the 28-year-old assessed her condition and chose to continue the match. After Alexandrova won her service game, the trainer came out for Azarenka to evaluate her actual condition and whether she could continue playing. She received some tape to her right knee area during the medical timeout before getting back to action. She delivered a strong service hold to level at two-all before getting the lead courtesy Alexandrova’s two double faults. Alexandrova held in the seventh to get back in touch with Azarenka before errors by the Belarussian helped her break back to square up at four-all. A third straight game by the 23-year-old earned her the lead at 5-4 as she tried to go a set up. Azarenka shut her first attempt down, holding two of three game points. She wasn’t the only one as Alexandrova held in the 11th to try and break to go a set up. The two players were forced into a tiebreak. She opened to a 3-0 run before the 23-year-old gained her first point. She picked up another two but it was the last she would get as Azarenka struck to take the next three, serving for set point. One got away from the Belarussian but she still got the result she wanted, going a set up on Alexandrova after one hour and eight minutes. She opened the second, serving well and her forehand came up big on the return to take a 2-0 lead. Her first serve was showing a lot more balance, giving her offense enough control to dominate. The Russian put together a service hold but Azarenka didn’t let slip her lead as she kept three games between herself and Alexandrova. She slowed the pace down in the sixth, causing Alexandrova to err in the rallies. She regrouped to force deuce from 0-40 down and win on the second ADV. While it frustrated Azarenka, she battled her issues and got the key game that put Alexandrova on the verge of defeat. Azarenka eventually managed to seal the victory and she faces Karolina Pliskova in the second round on Wednesday.